It was during the late 90 when pop culture dominated by the social environment. De la mode with vilification, food to the music, it has been incorporated as all influenced by trends abroad. For the music scene, most bands played Top 40 hits and similar-sounding "originals. It was simply stereotyped. During this decade came to an end, the entire Philippines music scene has been blown with a demo recording catch airplay in a radio station - it was NU107's In The Raw program where they have new and unsigned bands . "PIGFACE" was the title of the single and "GREYHOUNDZ" was the name of the artist. Brave, bold and aggressive, is the best way to describe both the song and the artist. Everyone who had the taste was shocked and bewildered about how to define what they had just heard. It was the first time in Philippine airwaves that the "type" of music was played. Public acceptance has been incredible, and the sound has been recognized as a new alternative. 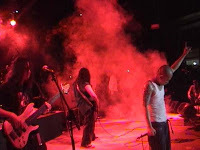 The "New Metal" genre was created or how Greyhoundz fans and critics would say, the HU-POW movement. It was so powerful "Pigface" as it was spread across the stage. Now, the Pinoy eksena has a new son for the feast. Hordes and hordes of fans have been collected throughout the country, resulting in a number of followers gargantuan. The eksena really took off when Greyhoundz released their first album, 7 Corners Of Your Game in 1999. Sony Music released in the Philippines, this album is the raw and most powerful tracks still attractive. Songs like "Mr. PIG," "Leech" and "A Part 802" group displayed versatility in song writing. Heavy rock meets hip-hop - as we all know how the two clashed during standards. Needless to say he was Greyhoundz that filled the gap. The album also hit Platinum, making an evil Greyhoundz and heaviest band in the country. Mid-year 2005, the "wave" has never ceased… "APOY" was released. Despite the untimely passing of a brother to join our Creator, Greyhoundz never stopped. The band even received more fuel all the difficulties, the joy, frustration and the positive energy they had. "Apoy" is dedicated to the same brother that followed, knowing that this was what he wanted to do the band… move forward and to do their best to be.